Posted June 28, 2017 by admin & filed under Featured Inner West Independent, Inner West Independent. After 6 years of staunch opposition, the pushback against the WestConnex motorway has spearheaded a new era of expression as locals this week launch an exhibition showcasing heritage items salvaged from the development’s 33km path of destruction. The exhibition features a myriad of multimedia artworks including printed photos, 3D films and costumes made by WestConnex activists to challenge the mammoth $16.8 billion project. Organiser of the exhibition Cynthia Moore said the launch represents the advent of a new groundswell of opposition to WestConnex, as artists rail against the development’s carnage. “While WestConnex has invaded and destroyed homes, communities are uniting to express resistance through protests, paintings, film, photography and repurposing salvaged heritage items from demolished homes. These are the new icons of resistance and represent the resilience of the affected communities,” she said. Ms Moore says the exhibition reimagines the traces of destroyed communities. The launch comes as Lord Mayor Clover Moore rallied against the project and last month made public a proposal for an alternative plan, which was rejected by Premier Gladys Berejiklian. 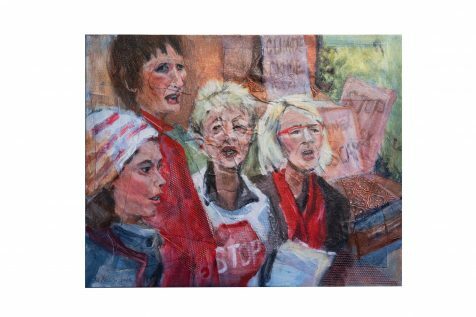 Greens MP for Newtown Jenny Leong said the exhibition is the most recent in a series of exhibitions and events which demonstrate the connection between art and activism and voices opposition to the state government’s controversial development. “The Liberal government has pushed this project onto the people of NSW, without listening to the strong criticism from the state and commonwealth auditor generals, without listening to expert transport planners or the public who don’t want their roads sold off and tolled by private companies. “The Liberals are draining the public purse to build this exorbitantly expensive series of tunnels which will lock Western Sydney into unfair tolls for many decades – the ALP has to unequivocally call for a halt to this disaster and stand with the community and the Greens,” she said. One of the contributing artists, Janet Kossy said the exhibition provided an outlet for residents whose houses were destroyed. According to Ms Kossy, grassroots campaigns such as that against Westconnex are crucial to democratic processes. “I hope that people will understand from the show that it is not necessary or inevitable to allow audacious politicians and their crafty mates to determine what happens to our shared world. Standing up for humane values is worthwhile and rewarding even if you don’t win the first battle,” she said. Ms Moore said the artworks not only mourn on past losses, but foreshadow the horror that is destined for properties in the path of the motorway. “Communities are devastated with the realisation that new tollways are being planned in the Inner west with even more destruction. In the exhibition, there are displays and photographs of demolished homes that emphasise the loss of history and rich heritage in parts of Ashfield, Haberfield and Concord. This represents the fate of many more homes and businesses that have been destroyed in St Peters for the new M5 Tollway and those to be demolished for the M4-M5 link in Rozelle and Lilyfield,” she said. Helen Grace, one of the artists whose works features in the exhibition, said that it is crucial for grassroots protests to continue having a stronghold on public discourse around the development. The move comes as staunch protestor to WestConnex and Independent candidate Pauline Lockie runs for the Stanmore Ward of the Inner West Council in the upcoming election. “The displacement caused by WestConnex has been massive. Thousands of people have lost their homes or businesses. Residents have seen their communities destroyed, and their trees and green spaces razed. They also face having their neighbours bisected by massive feeder roads, and having their air polluted by unfiltered stacks and big increases in local traffic,” she said. The commencement of the WestConnex development in Alexandria sparked a swathe of criticism after Greens MP Jenny Leong was forced to intervene when protestors were cordoned off during developments. Ms Lockie said that the development has uncovered shocking conflicts of interests within government. “Follow the money. If you look at which companies are likely to profit from WestConnex, you’ll see that many of them have a long history of making big political donations to the Liberal, National and Labor parties. Those donations don’t come without strings,” she said. Amidst intense debate over the propriety of the development following the privatisation of the body managing the development, Ms Lockie says she will fight to halt work on WestConnex and minimise its impact on the community. With a lack of transparency by consecutive state governments, Ms Lockie says it is crucial that politicians are held to account. “The Berejiklian government isn’t interested in democratic, sustainable, people-centred planning. Their only priority is to transfer huge amounts of public money and planning into private hands, with as little transparency as possible,” she said. Disconnex: Reframing Resistance is at Chrissie Cotter Gallery, Pidcock Street Camperdown from Wednesday 28 June until Sunday 9 July, 11am-4pm Thursdays – Sundays. Opening Night – Wednesday 28 June, 6-8pm.